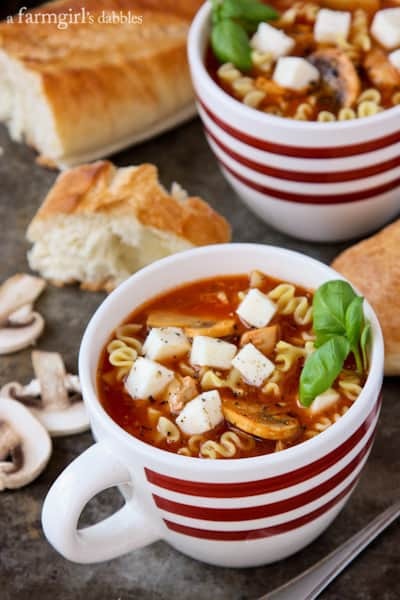 This Slow Cooker Lasagna Soup with Chicken and Mushrooms is a fun rendition of the very popular Lasagna Soup I originally shared with you a few years ago! After fielding many requests for a slow cooker version of the original Lasagna Soup recipe I shared with you a few years ago, I have one ready for you. I started working on this late last winter, and then lost my soul to the warm weather months and didn’t pick it up again until this winter. 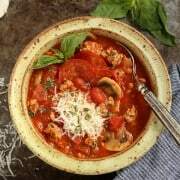 This Slow Cooker Lasagna Soup with Chicken and Mushrooms incorporates a number of changes and/or substitutions that you’ve been asking about… Can I use something besides Italian sausage? Would chicken work? Do you really use three cups of chopped onions, or is that a typo? What if I don’t like ricotta cheese? But mostly… Can I make this in a slow cooker? 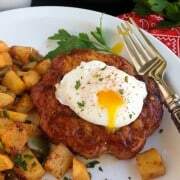 Even though I completely adore the Italian sausage used in the original recipe, I knew that the next version needed to incorporate a substitute. And that meant needing to add in quite a bit more flavor, because the sausage gives the soup an extra punch that makes it irresistible to me. You’ll find an increase in dried herbs and spices, plus sun-dried tomatoes and a good dose of fresh sliced mushrooms. I could eat sun-dried tomatoes and mushrooms for almost every meal of every day, and find their presence always lovely in both flavor and texture. 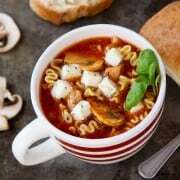 Looking for lasagna soup that’s completely vegetarian? Check out my friend Heidi’s version. And, if you were wondering…three cups of chopped onions is correct. 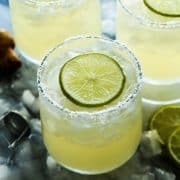 I know it seems like alot, but the recipe makes a large batch. The soup is not strong in onion flavor. It’s just good and flavorful, and I’m sure the onions play a big part there. The main thing to remember about the noodles, whether you’re making the original stovetop version of this soup, or this new slow cooker version, is to not add the noodles to the soup until you are ready to serve it. Cook the noodles separately and then add them to individual bowls, with hot soup ladled over the top. This will keep the noodles in al dente form, especially if you have any leftovers. If the noodles are incorporated into the soup and then stored as leftovers, the noodles will break down and get mushy. It’s really not desirable at all. The other major change I incorporated was switching out the original version’s awesome “cheesy yum”, a mixture of ricotta and Parmesan. A dollop is added to each individual bowl of soup, yielding a super flavorful cheesy concoction that layers on more wonderful lasagna flavor. I love it. But our youngest daughter, plus a number of other readers, voiced how they don’t like ricotta…and they wondered if there was a substitute, something equally fun and cheesy. 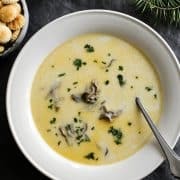 So this slow cooker version suggests adding cubes of fresh mozzarella instead, a favorite ingredient of the Chicken Tortilla Soup my family loves. 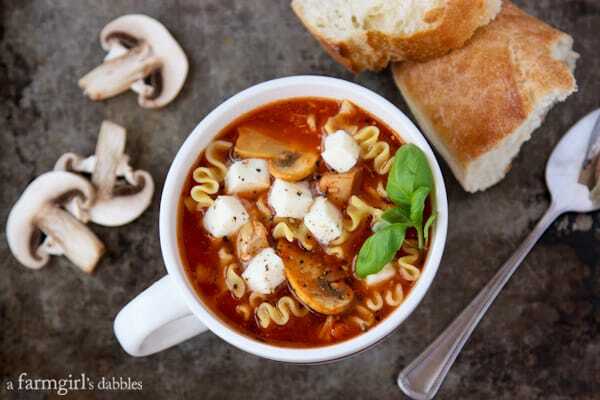 Once the mozzarella gets cozied up in the warm bowl of soup, it gets all gooey and chewy. For all you ricotta naysayers, this mozzarella plus a bit of freshly shaved Parmesan surely does the trick! Hi, I have burned my family out on the lasagna soup. So I haven’t cooked it all this winter. But this sounds to good not to try it. I have got it started, looking forward to see how it turns out. If I am using the original recipe with the sausage, do i have to cook the sausage first or can i put it in the crockpot raw with all the ingredients and let it cook that way? This sounds delicious! 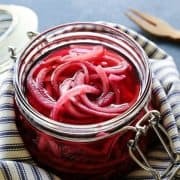 Question about the noodles.. Did you attempt using uncooked noodles in the slow cooker version? Great tip to keep them separate though! Hi Kerri – no, I didn’t. I knew we would have leftovers and didn’t want the noodles to turn to mush. Sounds good. My question is what about calories for us weight çonscience. I like crockpot cooking but for a smaller àamount. Hello Eileen. 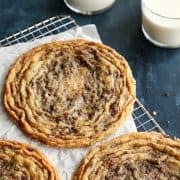 I do not include calorie counts on my recipes. Sorry! I made this soup yesterday and it was very good! Thanks for sharing. Hello Mary – I’m so glad you liked this soup! Thanks for coming back to let me know. Happy New Year! Becky… Make some zucchini ribbons with a vegetable peeler and add instead of pasta. Might need to gently sauté them or microwave for a very short time, trial and error here. If I thought the soup would be eaten In a meal maybe two and not being frozen I would throw them in the crockpot at the end and just test them until they are tender not mushy. Hi all, loving the look of this recipe – do you know if it can be frozen once cooked? I’m guessing I’d need to leave out the pasta/noodles, but what about the rest? :) Thanks! Just leave out the noodles! 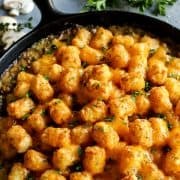 Is this crockpot version have so many added ingredients due to sausage substitute alone, or because it is in the crockpot as well. I want to substitute hamburger meat, but why a 28 oz can of tomato sauce? You have to love a soup that is slow cooker friendly. Lovely. The slow cooker is my friend. I work. Soup is my friend. I gain weight. I love lasagna. Lasagna is not my friend. I gain weight. too—-to play off Marie’s famous line. So very clever, my whole family would love this one. great tip about the noodles. Wonderful comfort food! I love it! Perfect comfort food and made in a slow cooker?! Love it! Love that you took this recipe in another direction by using chicken and mushrooms to such a well loved recipe of lasagna. Anytime you can make a delicious recipe in a slow cooker, I’m in. Thanks for the great recipe!! Ummm this sounds amazing and in the slow cooker… even better. 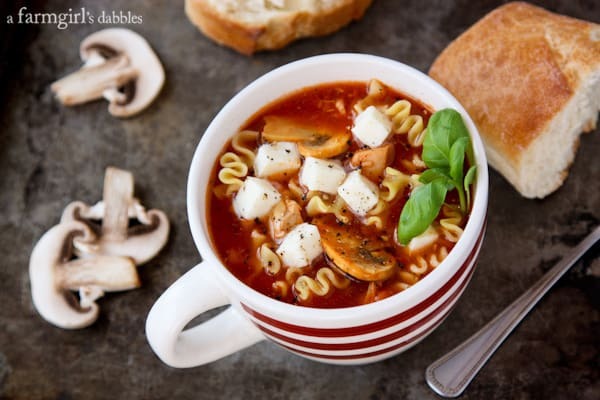 Slow-cooker soup is my fave and this one looks so good! Oh Brenda this looks AMAZING! I cannot wait to make this! This looks so good! 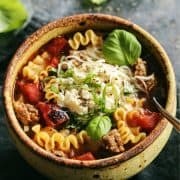 I love a slow cooker version of any meal, but Lasagna soup? That sounds like a real winner, especially at my house! Brenda, this sounds so good. Today feels like a slow cooker day here in Oregon – rainy and chilly. Good comfort food! Since we seem to be in the winter that will never end… I need new soup recipes. And I LOVE using my slow cooker. Pinning this to try soon!